$50.00 "Worker's Kronstadt" newspaper, 28 November 1939 issue - printed on the eve of the war against Finland. Russian text. $30.00 "Vpered za Stalina" [Forward for Stalin!] Newspaper, July 17 1940 issue. 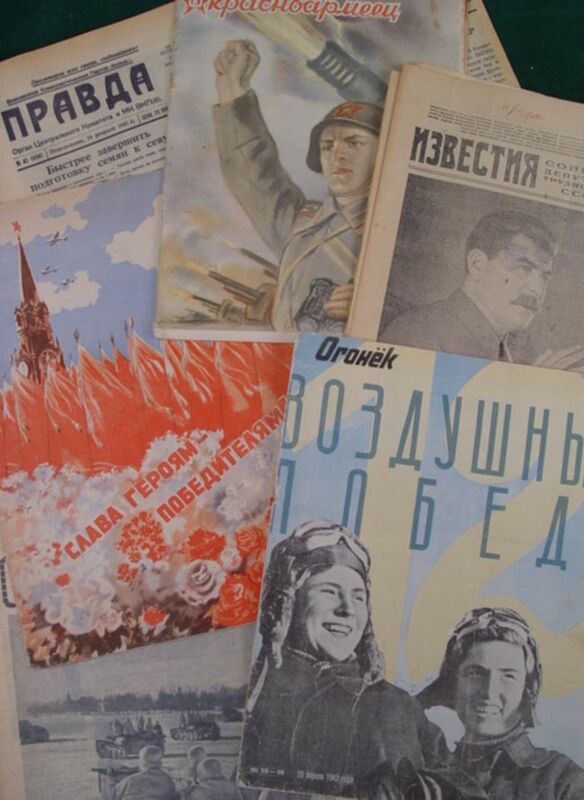 $29.00 Pravda Newspaper, January 1945 through April 1945. $24.00 Izvestiya [News] Newspaper, December 1944, very good condition. $15.00 Sovetskaya Ukraina [Soviet Ukraine] Newspaper, January 1943 through July 1944. $15.00 Soviet Information Bureau Daily War Communique, Soviet Stalingrad counteroffensive. $19.00 Soviet Information Bureau Daily War Communique, 8 June 1942.